European swallow-wort, most commonly known as dog-strangling vine, is a member of the milkweed family. Despite its name, it doesn't pose any real threat to dogs. Unfortunately, it does pose a significant risk to native plants and habitats. Also known as dog-strangling vine (DSV), it is native to Eastern Europe, having arrived in Canada with European settlers approximately 120 years ago. It has become established throughout many parts of southern Ontario and continues to spread at an alarming rate. Its prolific seeds are small and have a feathery parachute attached, making them easily dispersed by the wind and able to travel great distances. DSV leaves resemble milkweed leaves — they are oval-shaped and arranged oppositely on the plant stem, but they are darker in colour and smaller in size than their relative, helping with identification in the field. The small, pinkish or maroon flowers, which bloom from late May to mid-July, also help to identify the alien plant. The yellow-green seedpods appear as early as June and can continue to grow well into autumn. In early spring DSV begins growing upright until eventually it cannot support its own weight. It then becomes vine-like, creeping along the ground, twisting and twining around virtually anything in its path, including other plants and trees. Eventually, it may become completely tangled in whatever it climbs. DSV is a perennial plant and grows from its well-established root system each spring, making it even harder to control. DSV is an invasive alien species in North America. It can grow in a variety of environments, from forests to open areas. It is a master at displacing native species from the areas in which it grows. DSV most easily displaces native species that are sensitive or rare, but it also impacts wildlife that relies on the displaced native species for food or breeding. The monarch, a species at risk in Canada, lays its eggs exclusively on some native milkweed species. These are the only plants that monarch caterpillars have evolved to eat. Some monarchs have been observed laying their eggs on dog-strangling vine plants. Caterpillars hatched on dog-strangling vine plants die because they don't have the food they need. Entire habitats are also affected by invasive species. Ontario's globally rare alvars are especially susceptible to invasions of dog-strangling vine. At some sites, DSV has overrun open alvar habitats, displacing plant species and the wildlife associated with them, such as insects and birds. As DSV thrives in open areas, it is extremely important to monitor alvar habitats for this species and to act early to eliminate it from these sites. What is NCC doing to control this species? The Nature Conservancy of Canada (NCC) and the Couchiching Conservancy are actively monitoring dog-strangling vine invasions on the Carden Alvar, and an eradication plan is underway. Each summer, Conservation Volunteers events are held to help remove DSV. Licensed also apply spot-pesticide to remaining DSV plants, to remove seedpods and monitor the site. Staff also visit the property in the fall to continue seedpod removal, which helps reduce proliferation each spring. Ultimately, an intensive, multi-year, repeated effort will be required in order to keep populations of DSV in check, and the NCC team is working hard to remove this threat from the Carden Alvar. There are a variety of ways to deal with dog-strangling vine: small populations can be hand-pulled or dug out, and large populations are best treated with herbicides. Seedpods should be removed to prevent dispersal. Rot plant material in black garbage bags in the sun prior to disposal in a landfill. Medium and large populations can be treated with herbicide by a licensed exterminator or covered with a heavy tarp to slow growth. To eradicate the population, control treatment must be repeated over many years. Dispose of yard waste properly. Dumping yard waste in natural areas can introduce alien invasive species that will thrive and spread. Even leaf piles can be problematic, as dumped piles can smother native vegetation. Contact your municipality to find out how to dispose of yard waste properly. Plant native species in your garden! There are lots of beautiful native species that attract native butterflies and birds, making your garden twice as beautiful. Native species are also adapted to our climate and often require less rigorous care than exotic species. Report sightings of invasive plants to your local stewardship council, or call the Invasive Species Hotline at 1-800-563-7711. Finding these invasions early is a key to eradicating them. Clean your shoes or bicycle tires when moving between designated trails in different areas. 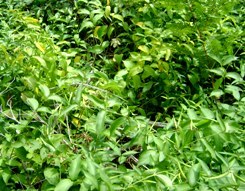 Invasive plants are often spread accidentally from seeds stuck in treads. For more information on invasive plants in Ontario, visit the Ontario Invasive Plant Council website.